Your weekly guide to the wild world of healthcare policy research. Joseph Antos of the American Enterprise Institute describes Obama's approach to healthcare as "a meal eaten in reverse order. We started with dessert, in the form of new subsidies for insurance. Whether we like it or not, we will have to eat our vegetables before the year is out." John Calfee and Elizabeth DuPre of AEI complain about the anti-drug industry bent of The Lancet and The New England Journal of Medicine. Newt Gingrich wants to create some new government programs to combat Alzheimer's Disease. Darrell West and Edward Miller of the Brookings Institution have published a new book entitled Digital Medicine: Health Care in the Internet Era. Alice Rivlin of Brookings is concerned that Obama won't raise taxes enough to pay for his healthcare plan. Judy Feder and Harriet Komisar of the Center for American Progress urged the Senate to take "action to improve long-term care services and supports." J.D. Foster of the Heritage Foundation reflects on how to make Medicare sustainable by means-testing benefits. Uwe Reinhardt, the Princeton economist, explains the terminology behind health care reform. Joseph DiMiasi and Laura Faden of Tufts reviewed the histories of 298 drugs approved by the FDA between 1996 and 2006 to identify "factors associated with multiple FDA review cycles and approval phase times." Nicolaus Henke, Sonosuke Kadonaga, and Ludwig Kanzler of McKinsey argue that Japan's healthcare system is unsustainable, and suggest that the Japanese undertake a "comprehensive, well-funded national review of the system." I bet they find that 2 plus 2 still won't equal 5. John Graham of the Pacific Research Institute "reviews three decades of the Food and Drug Administration's performance and concludes that the agency is overfunded, overstaffed, and denies hundreds of thousands of Americans timely access to new medicines." Henry Willis et al. of the RAND Corporation believe that the Cities Readiness Initiative has succeeded at improving the ability of large cities to respond to large-scale biological warfare. Next Week: On Tuesday, March 31, the Cato Institute will host (and webcast) a policy forum entitled "Can the Market Provide Choice and Secure Health Coverage Even for High-Cost Illnesses?" Whether or not you agree with the President's proposed healthcare reforms, they're based upon flawed assumptions. Between 2000 and 2007, average premiums rose nearly 80 percent. At the same time, average wages rose just 15 percent. How can a family keep up? Last year, the average household spent more than a quarter of its income on health insurance premiums. If we don’t act to reduce the rate of health spending, then in seven years — before the end of President Obama’s second term — most American households will spend nearly half of their income on health insurance. To be more precise, if wages rise by exactly 15% in the next seven years and if insurance premiums rise by another 80% over the same time frame, a family which spends 25% of its income on health insurance today will spend 39% seven years from now (without adjusting for inflation). While that would be an increase, Baucus exaggerates the degree. More importantly, it is arbitrary to assume that premiums will rise over the next seven years by the same degree that they did between 2000 and 2007. Indeed, according to the Kaiser Family Foundation, the rate of increase in family insurance premiums has declined for 6 straight years, from 13.3% in 2003 to 4.7% in 2008. If insurance premiums increase for seven years at 4.7%, the total increase is 38%, not 80%. And none of these numbers reflect how the present economic crisis is affecting premiums and wage growth. This is not to say that Baucus' projections are inconceivable. But it is to say that they are arbitrary. Affordable healthcare is an important goal—but we won't get there if we don't understand healthcare economics. If we don’t act, increasing costs will result in more and more individuals and families without health insurance. According to the Kaiser Family Foundation, 160 million Americans get their health benefits through an employer. That means that when people lose their job, they often lose their coverage. This month, the unemployment rate rose to eight point one percent. Work done here at the Center for American Progress shows that — every day — 14,000 more people lose their health insurance coverage. This problem is a serious one, but it was caused by government intervention: the taxpayer subsidy of employer-provided insurance. Baucus proposes to solve a problem caused by unwise government regulation by nationalizing healthcare. A simpler, and more efficient approach, would be to end the subsidy for employer-provided insurance. President Obama is, apparently, now open to this approach. But when John McCain proposed this in the 2008 campaign, then-Senator Obama described it as "the largest middle-class tax increase in history." Imagine if you could shop for health insurance the way you shop for auto insurance or life insurance. You could find a plan that made sense for you, that covered the things that are important to you. You could organize a community of like-minded people to purchase insurance in bulk. Most of all, you would create competition for your business, the surefire way to bring prices down and quality up. Anthem Blue Cross in California just notified most of its individual policyholders that they face double-digit premium increases — many more than 30 percent. Blue Cross of Michigan is seeking approval for an increase in premiums of nearly 60 percent. That means that if we don’t act, then workers who lose their jobs will not be able to afford coverage. It means that many of those purchasing coverage in the individual market will be forced to drop their coverage. Insurance companies, like most businesses, operate in the real world of supply and demand. They can't raise prices forever without losing customers, just as car companies can't suddenly double prices on cars. Simply put, it is not in insurers' interests to lose customers, and that self-interest will keep a lid on premiums. Ultimately it is up to insurers to decline to pay for the most expensive treatments if they can't afford to offer them. The problem comes when states mandate what insurers must cover, forcing the price of insurance higher. An individual obligation to get health coverage is essential for several reasons. It is the only way to stop the cost-shifting related to uncompensated care. Today, the costs of care for 46 million Americans without health insurance are largely borne by those with insurance. This is an idea, pioneered by Mitt Romney in Massachusetts, which deserves bipartisan support. Libertarians raise instinctive concerns about any government mandate. But federal law requires hospitals to treat anyone who comes into an emergency room, regardless of his ability to pay, thereby taxing those who buy health insurance at the behest of those who don't. Most states require auto insurance, yet libertarians don't spend a lot of their time seeking to repeal those laws. The manufacturing industry is facing stiff international competition. American manufacturers pay $2.38 an hour for health benefits. What do you suppose America’s major trading partners pay? 96 cents. Talk about an uneven playing field. American manufacturers spend nearly three times as much on health benefits as our major trading partners. If we don’t act, then that gap will continue to widen. The uneven playing field between U.S. and our major trading partners is not health benefits, but corporate taxes. Corporate income tax rates in the United States are the highest in the developed world: 39.25% in 2008, vs. the OECD average of 26.63%. And that's without the tax increases that inevitably would accompany a nationalized healthcare system. And if we don’t act, then the burden on taxpayers will continue to grow. In 2009, Medicare spending is projected to be nearly $500 billion. By 2018, it will be almost double that. If we don’t act, then in the next 10 years, spending for both Medicaid and Medicare will more than double. Meanwhile, our economy will grow by just 64 percent. So the solution is to spend more on healthcare while inducing economy-contracting tax increases? Already, we spend twice as much on health care as any other industrialized nation. And yet our outcomes are poorer. I will address this point in a future blog post, but the data does not support this argument. The way that we pay providers contributes to higher health costs. Existing payment systems reward the use of specialty care and high tech equipment. We pay more to a hospital whose patients experience a readmission after being discharged. And we pay less to a hospital that does the job right the first time and avoids a second hospital visit. Spending and utilization varies widely from one part of the country to another. But those who are spending more are not getting more for their money. In many parts of the country, providers have answered the siren call of the payment systems. They order more tests. They schedule more visits. They do more procedures. They perform more imaging services. And they prescribe more medications. Here we get to a critical point: cost. We are constantly told that it is a terrible thing that Americans are spending too much on healthcare. Somehow, we're never told that we spend too much on cosmetics, or televisions, or automobiles. According to the Bureau of Labor Statistics, Americans spend nearly as much on entertainment (5.6%) as they do on healthcare (6.0%), and far more on food (12.3%), housing (32.6%), and transportation (18.1%). Indeed, it could just as easily be argued that it is a good thing that Americans spend more on healthcare. We have access to the newest drugs and the latest technologies. We can see specialists when we have specialized medical problems. We can pay for medical procedures that we want to undergo. Efforts to provide universal healthcare coverage routinely ignore the question of rationing. That is, if we are to provide healthcare for all, how much healthcare will we provide for all? All you have to do is look at Massachusetts for a preview of what's to come: price controls and rationing. That is not to say that there aren't times when too many tests are ordered by physicians. But more often than not, this practice is driven by a desire to avoid malpractice litigation, a practice dryly termed "defensive medicine" by physicians. An important way to reduce healthcare costs which Baucus doesn't address is tort reform: limiting unnecessary litigation by requiring, as most developed countries do, the losing side to pay the winning side's legal costs. Another unspoken driver of healthcare costs is Medicare. The government underpays hospitals for the cost of caring for elderly Medicare patients. Hospitals make up the difference by overcharging people on private insurance. In other words, on top of the Medicare tax which you see on your paycheck every month, you are being taxed silently every time the government underpays a hospital for a Medicare patient. But if the government started paying hospitals fairly for their services, the Medicare trust fund would go bankrupt. If we do not act this year, then we won’t have another opportunity for another decade. Next year, we’ll be in the midst of Congressional elections. The following year, we’ll be in a Presidential cycle. We have to act now. 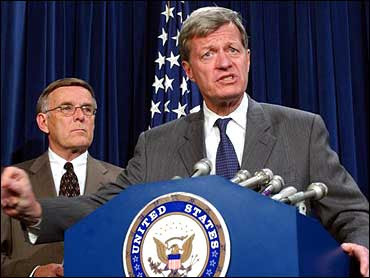 Baucus gets to the political reasons why enacting sweeping changes to the healthcare system has proven so difficult. Importantly, he appears skeptical of using reconciliation, a parliamentary procedure which would do an end run around Republican opposition, presumably because it would engender increased Republican hostility to other Democratic priorities. Baucus, a Democratic senator in Republican Montana, has a record of crossing party lines. He was a key supporter of George W. Bush's tax cuts in 2001, and worked with Republicans on the Medicare prescription drug benefit. So far, on the Great Healthcare Debate of 2009, he has adopted a traditional Democratic policy posture. Will he stay there?